Helps you monitor and measure the glucose level in your blood. Accusure Easy Touch Glucose Monitor – Free 25 Test Strips is a remarkable device. this product helps you monitor and measure the glucose level in your blood. It is very crucial to keep a check on your blood glucose so that it does not deviate from the normal. 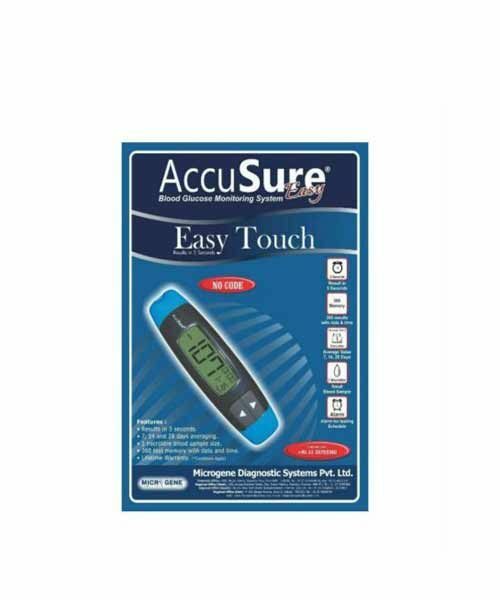 Accusure Easy Touch Glucose Monitor – Free 25 Test Strips helps you keep a tab on your blood glucose. Testing your blood sugar level is one of the best ways to understand your diabetes and how different foods, medications, and activities affect your diabetes. Keeping track of your blood glucose can help you and your doctor make a plan to manage this condition. People use portable blood glucose meters, called glucometers, to check their blood sugar levels. These work by analyzing a small amount of blood, usually from a fingertip. The glucometer lightly pricks your skin to obtain the blood. Meters tell you your current blood sugar, but since blood sugar levels change, you need to test levels often and record them. 360 test memory with date and time. 7, 14 and 28 days averaging. 1 microliter blood sample size.